Bap, a staple of Korean food, is steamed rice. It may also include other grains. There are many kinds of bap depending on the ingredients such as huinbap (white rice); japgokbap (rice with barley, millet, and beans); byeolmibap (rice with vegetables, seafood and meat); and bibimbap (rice mixed with namul and beef). Juk is one of the Korean dishes that was developed in early times. It consists of grains simmered for a long time with 5 to 7 times the volume of water. There are many varieties of juk depending on the ingredients. Juk is not only served as a main dish but it can also be part of a special meal. It is served to patients and eaten for health. Korean noodles are made by kneading wheat flour or buckwheat flour and drawing the dough into long coils. Noodles helped develop the use of chopsticks in Korea. Mandu is a dumpling made of thin wheat flour wrappers stuffed with fillings then steamed, or boiled in jangguk (soy sauce soup). It is a specialty of the northern area of Korea. Tteokguk consists of diagonally sliced white rice cakes that are simmered in jangguk. It is served on the first day of the year. Guk is a soup of vegetables, seafood and/or meats boiled in plenty of water. Some varieties are malgeun-jangguk (clear soy sauce soup), tojangguk (soybean paste soup), gomguk (rich beef soup) and naengguk (chilled soup). The standard Korean table setting always has bap and guk. Guk has helped develop the use of spoons in Korea. Jjigae has less water and more solid ingredients than soup, and it is saltier. Varieties include malgeun-jjigae (clear jjigae) and tojang-jjigae (soybean paste jjigae). Jeongol started as a royal court food. It consists of meat, seafood, mushrooms and vegetables simmered in broth at the table just before serving for dinner or as a dish to accompany liquor. Jjim is a dish of main ingredients cooked with seasonings in deep water. It may be boiled with soup just above the solid ingredients, or steamed. Seon means “good ingredients.” It is a dish of vegetables such as pumpkin, cucumber, eggplant and cabbage or tofu stuffed with beef and/or mushrooms that is steamed or parboiled in broth. Jorim is a cooking method to braise meat, seafood or vegetables with soy sauce or red pepper paste on low heat. The ingredients are cooked for a long time to allow the flavors to seep in. It may have strong seasonings and can last a long time. Cho (janggwa) is a dish of boiled sea slugs, abalone and mussels with seasoning on low heat. Then starch liquid is added and boiled. The resulting soup is quite thick and glossy. Bokkeum is a stir-fry of meats, seafood or vegetables. There are two types of bokkeum dishes; one is just stir-fried in an oiled frying pan, the other one is stir-fried with soy sauce and sugar. Gui is a dish of grilled meats, seafood or vegetables as is, or grilled after seasoning. 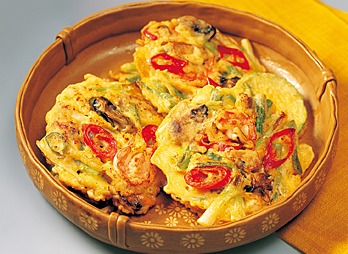 Jeon is a dish of pan-fried meats, seafood or vegetables after they have been minced or sliced and coated with wheat flour and beaten egg. Jeok is a dish of pan-fried ingredients after they have been seasoned and skewered. Hoe is a dish of raw meat, fish or vegetables seasoned with vinegar soy sauce, vinegar red pepper paste, or mustard. It can also be blanched in boiling water. Pyeonyuk is a dish of pressed and sliced beef or pork. Jokpyeon is a dish of long-simmered ox-head and ox-feet that is solidified and sliced. Mareun-chan is a dry side dish made of salted and seasoned meat, seafood and/or vegetables that can be stored for a long time. It is enjoyed dried or fried. Jangajji is a side dish of pickled vegetables that include Korean radish, cucumbers, bellflower roots and garlic in soy sauce, soybean paste or red pepper paste. It can be stored for a long time. Jeotggal is a side dish of marinated shrimp, anchovies or clams with salt that is fermented. It is served as a side dish or used as a seasoning. 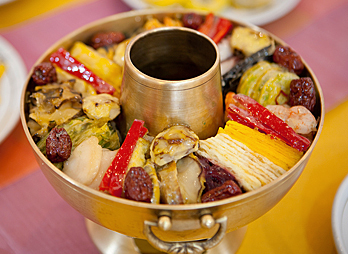 Sukchae is a dish of parboiled vegetables. It may be mixed or fried with seasonings. Sukchae is a popular basic side dish in Korea. Saengchae is a seasonal fresh salad dressed with vinegar soy sauce, red pepper paste or mustard. It is sweet and sour. This method of preparation is best for preserving the taste and most of the nutrition in the ingredients. Kimchi is a dish made by marinating Korean cabbage and Korean radish with salt, seasoning it with red pepper, garlic, green onion, ginger and salt-fermented seafood, mixing it thoroughly and letting it ferment. Kimchi is the quintessential side dish in Korea. It is a typical fermented and storable food. Tteok is a dish made by steaming, frying, or boiling rice powder or other grain powder after it has been sprinkled with water. It is served at ceremonies and holidays without fail. 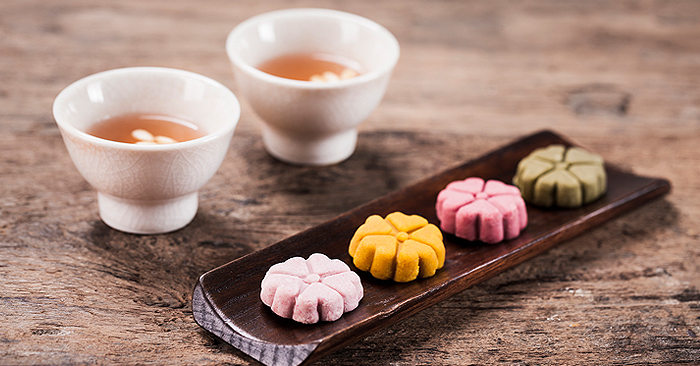 Hangwa are traditional Korean cookies. There are many varieties depending on the ingredients or recipes such as yumilgwa, gangjeong, sanja, dasik, jeonggwa, suksilgwa , gwapyeon, yeotgangjeong and yeot.